There seems to be a bit of a scam going around with several companies offering to “help” you renew your USCG Vessel Documentation, the catch? The help will cost you several times the normal cost $ 26.00 the US Coast Guard charges. Some people in a sailing group I belong to have fallen for this scam. 1) You go to the internet and search for something like “USCG Vessel Documentation” and click on one of the links that looks like a Vessel Documentation link, the bogus links look real official as do the web pages. From there you are prompted to click on some links and enter your vessel information and pay some money. The catch? One of the sites I looked at wanted $ 76.00 for a single year, a nice $ 50.00 service fee. The Coast Guard site is so so for search engines so the official US Coast Guard Vessel Documentation site was down toward the bottom of the first page for me, so you need to look and be careful or use the link posted below. 2) The other is the letter I received a few weeks ahead of the letter from the US Coast Guard. The letter had a return address of West Virginia in case you remember that the Coast Guard National Vessel Documentation Center is in that state, some small problems, different city and the letter was postmarked California and was standard US Postage and not US Official Mail. The letter is a masterpiece by their lawyer with bold print, Vessel Renewal, Set to Expire and the list goes on, yes they do mention a service fee and offer Multi-Year renewal (the US Coast Guard does not offer multi-year renewals) and you are given a website and phone number to call. No costs are mentioned so they want you to call so they can give you the sales pitch first. How not to get scammed? If your Vessel Documentation is current the US Coast Guard will mail you a renewal notice, mine came about eight weeks before my documentation was to expire. NOTE: if you did as I did one year and forget to send in the renewal notice the Coast Guard will not send you a second notice and I had to pay an extra fee a year or so later. If you have questions, start with the the official Coast Guard website for Vessel Documentation at http://www.uscg.mil/nvdc/ my experience with the people there was very good when I had some problems and questions about renewing my Vessel Documentation. 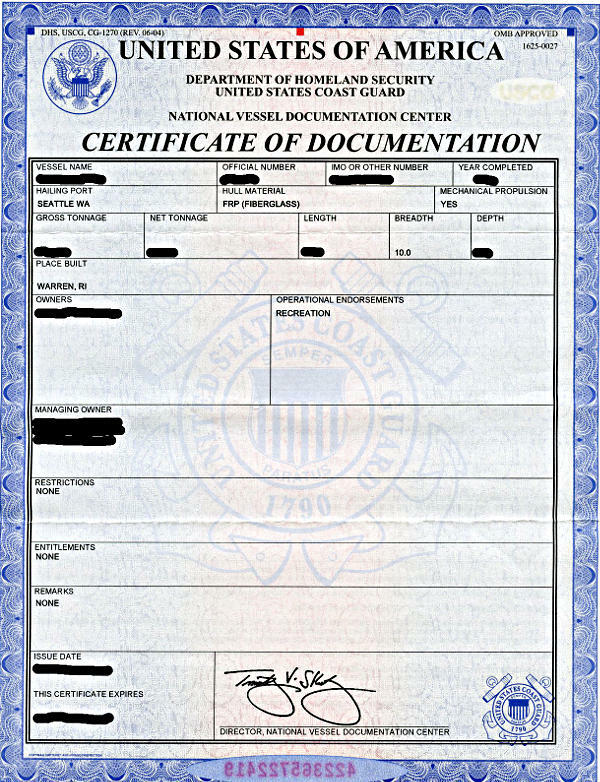 To obtain official forms, visit the USCG NVDC website or contact NVDC at (800) 799-8362 or (304) 271-2400. Phone hours are 9:00 a.m. to 3:00 p.m. Monday, Tuesday, Wednesday, and Friday; phones are not manned on Thursdays. Application packages and documents eligible for filing (in .pdf format) can be e-mailed to nvdc.pdf.filing@uscg.mil or faxed to (304) 271-2405. COD Renewal requests (Form CG-1280) are accepted via vdc-pf-nvdcrenewals@uscg.mil with credit card payment of $26.00 via Form CG-7042. My thoughts on why the Coast Guard just has a warning and it not stamping these out is that they probably do deliver the renewal, even if it is at a price and conditions that most people would consider a ripoff, so just over charge and not fraud which would be taking your money and not doing anything. When I purchased my boat and the title and other papers taken care of, the Vessel Documentation was transferred and renewed for a year, so I would think they would do the yearly renewal if you really wanted to have someone else take care of these details, there are also services to help cruisers and I would be surprised if some of them could not help. Looking around on the internet I found several people that had ran into the US Coast Guard Vessel Documentation scam, even saw one point where one of the more aggressive companies was trying to defend their practices, nobody was much buying his argument and some commercial fishermen seem to be ready to use the owner of one of the Vessel Documentation “services” as fish bait. This entry was posted in Boating Safety and tagged Vessel Documentation. Bookmark the permalink. These same operator claim to “help” renew NEXUS cards. We ran into one based in Malta, with the funds probably going to Russial. The company I received a letter from had an address I traced to property owned by West Virginia State University (letter was also mailed from CA). I notified their VP of Administration that they were leasing property to an unethical business. Also notified USCG.